DeWalt products are simply amazing. Time and time again they’ve proven themselves as the true champion of construction tools. The DeWalt D24000S 1.5 Horsepower 10 Inch wet tile saw is everything you need in a compact package. It measures 34 X 26 inches. It’s easy to lift and transport at 69 lbs, and you’ll be thankful for the weight if you have to take it on the road. For miter cuts, the angled grooves allow you to make cuts at 22.5 and 45 degrees. The cut depth is set at 3 1/8 inches, and plunge cuts are easy with this saw too. Dual water nozzles work to keep the blade cool, reduce dust, and allow you to work for extended periods. If you weren’t aware or are new to tile cutting, a hot blade can fracture tile, so you always want to make sure you’re working with a wet blade to reduce the heat. The ABS five gallon pan allows for plenty of water, and the removable cutting cart makes clean up a snap. This DeWalt product comes with a three year warranty and one year free service contract that’s the best in the business. DeWalt always stands behind their warranties and they’re a great company to do business with. QEP has established itself as a winner in customer feedback with the construction and home improvement community. The 1 1/2 horsepower motor is strong enough to get through nearly any material, and it comes complete with a heavy duty stand with rear locking wheels. 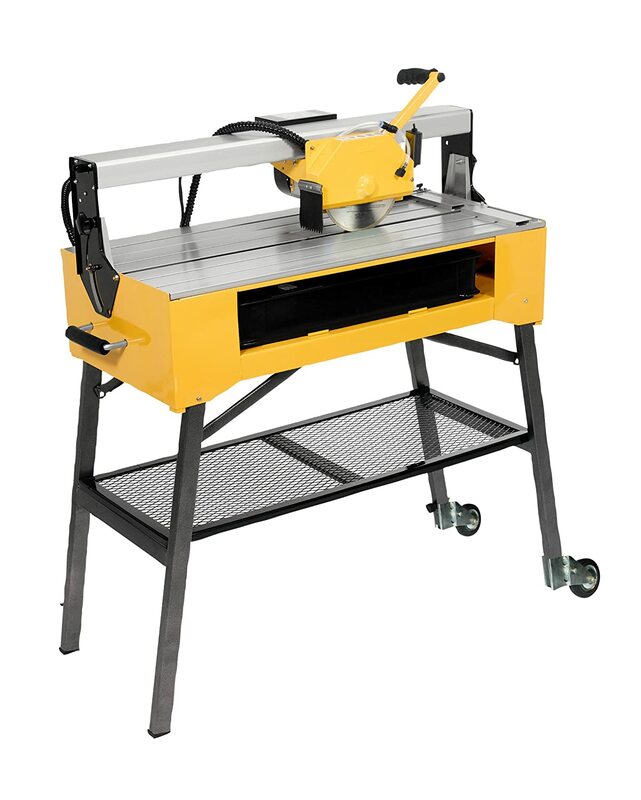 The miter system with this saw allows you to make 45 and 90 degree cuts easily. Keep in mind that this is a tile saw with a water pump system, working efficiently to keep the blade cool and eliminate dust. It also comes with a 8 inch continuous rim diamond blade to get you off and running right out of the box. It’s helpful to remember that although it’s a quality blade, shopping for other blade types can increase the amount of work you can get done with the saw. 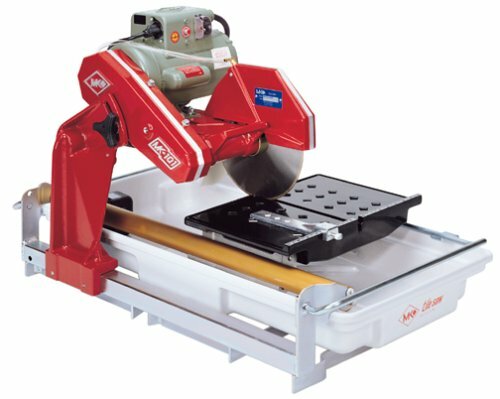 We liked the QEP 83200 24 Inch Bridge Tile Saw because QEP is a great brand and the reviews have been impressive. MK Diamond is kind of a new player in the area of wet cutting tile saws. The MK Diamond MK-101 Pro Wet Cutting Saw comes with a 12.6 amp 1.5 horsepower motor. It’s truly enough power for all tile materials. It’s fan cooled, so heat won’t be much of an issue, and the multi position motor posts allows you to adapt to various tile sizes without a problem. And, the locking blade shaft allows you to remove blades quickly and easily, and as you remember, we mentioned that in the guide and how it relates to increased productivity. It comes with a 10 inch wet cut diamond blade, water pump to keep the blade cool and reduce dust, side extension kit, and folding saw stand. And, keep in mind that professionals have been using this product and given it a great score. So that means it’s really a quality product that’s at least worth considering.